Zadro 1x/10x Next Generation LED Wall Mount Mirror from HealthyKin.com is cordless so you can mount it anywhere in the house. Dimmable on/off switch. Uses 4 C batteries-not included. Batteries last for one to two years with regular use. 360 degree swivel. Lifetime "Eco-Friendly" LED bulbs never need replacing. External power adapter included if you don't want to use batteries. 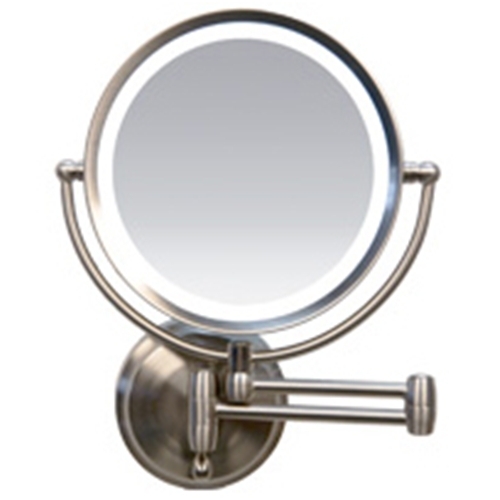 Unit size 11"W x 14"H. Base 5" and 1½" D. Mirror 7¼". Arm extends 12''. Satin nickel finish.